If you’re planning on watching the solar eclipse on Monday (August 21, 2017) you already know that you should not look at it directly. No, you won’t go blind, but you can severely damage your eyesight. Even looking at the full eclipse – where there’s only a sliver of sun – can burn the lining of your eye. To make viewing simple and safe, there’s a glut of eclipse glasses on the market. Usually cardboard frames with specially coated plastic lenses, the quality of these can vary widely. And, because everyone is trying to make a quick buck, there are concerns that consumers will think they’re safe but they’re not. Amazon put strict standards in place for vendors who sell them. Thousands of customers got a refund for eclipse glasses they purchased when Amazon discovered some didn’t offer proper protection. But don’t rush over to Amazon to buy a pair because they’re out of stock. You may be able to find a pair locally but check the American Astrological Society’s website for vetted vendors. While not comprehensive, it’s a good place to start. If your eclipse glass maker isn’t on the list, you can test them out by using them to look at a bright, LED light. If should be dim – and you shouldn’t be able to see any other light in the room. If you can, toss them. Eclipse glasses are meant to be worn alone. Don’t look through a camera, binoculars or a telescope since the magnification concentrates the heat from the sun and can cause burns. While you can buy special lenses for some devices, they’re expensive and you’re probably out of time. Can’t find good eclipse glasses? If you happen to have a pair of welding glasses, those offer good protection for eclipse viewing. Or, you can use the pinhole camera method. Here’s a step by step. Get two sheets of white cardboard or heavy stock paper. Prick one sheet in the center with a straight pin. Don’t think bigger is better for the hole size – a single prick will do. With your back to the sun, hold the pricked cardboard above the other piece of cardboard in front of you. You may need to move things around a bit but you should see an image of the sun appear on the cardboard in front of you. Adjust the distance between the two pieces of cardboard to make the image smaller or larger. One more thing public safety officials are worried about are distracted drivers. A glance or two at the sun is enough to not only damage your eyes but it takes your eyes off the road. We can’t all take the time off to watch the eclipse or pull over and wait it out. But if you can avoid driving or walking on busy streets during the eclipse period, better safe than sorry. The eclipse begins on the west coast around 10am Pacific time and should finish crossing the US around 2:40 PM Eastern time. 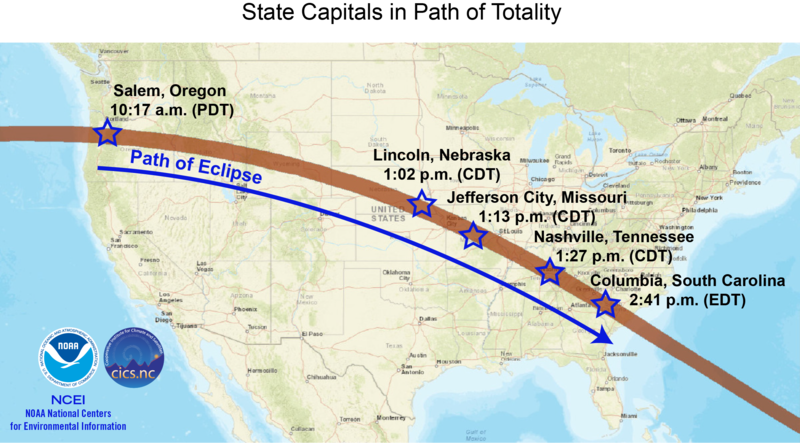 Those who will be able to see the total eclipse are marked on the map (larger image here). Outside of this area, the sun will still be partially eclipsed. That means more of the sun will be visible so you’ll need to be even more cautious with or without protective eye-wear.